Infowiz – one of the best AutoCAD Training Institute in Chandigarh offers one-on-one or batch-wise AutoCAD Training in Chandigarh for engineering students & professionals. This AutoCAD Course in Chandigarh is designed to help the entry-level Fresher & Experience Mechanical / Civil/ Electrical / Interior / Architecture Engineers (Masters or Degree or Diploma) in the field of designing models by 3D. AutoCAD is used across a broad range of industries, by architects, project managers, engineers, graphic designers, and many other professionals. AutoCAD is a 2-D and 3-D computer-aided drafting software application used in architecture, construction, and manufacturing to assist in the preparation of blueprints and other engineering plans building model’s database. Infowiz also provides Mechanical AutoCAD as well as Electrical AutoCAD. This AutoCAD training in Chandigarh is based upon theoretical & Practical design calculation & extremely concentrated upon the design of varies components by AutoCAD. This AutoCAD Course is divided into two segments; the first part is based upon theoretical study & design by AutoCAD system while the second part is based upon the practical design by Auto CAD Systems & some case studies. CAD (Computer Aided Design) indicates the creation, modification, and analysis of a design using computer systems. The result is normally in the form of electronic files for print, machining, and other manufacturing operations. The software is generally used to create digital content i.e. computer animation or special effects for movies, advertising or technical manuals. CAD software is widely utilized in industries like- industrial & architectural design, automotive, shipbuilding, aerospace, etc. Moreover, the software is a major driving force for research & development process. AutoCAD is computer software which is for the most part used in civil, mechanical, electrical and architecture trade. Architects, interior designers and other engineer’s take help of this software to draw 2D & 3D drawings or models. The term AutoCAD Drafters is normally used for professionals who use AutoCAD software. Our institute is offering training in advanced AutoCAD Course for all the candidates who are willing to create advanced drafting and elevations using AutoCAD’s 2D & 3D capabilities. Our institute prescribes the knowledge of basic dimensions of the related product or knowledge of related industry terminologies. If you have done by you any designing software earlier would be an added advantage for the training in AutoCAD Course. Relies upon the orientation of the program in which you have applied in our institute. As we have clarified before that AutoCAD is being used by many professionals for various purposes. So, the possible projects can be conducted by us in AutoCAD is Plan for a building, Multi-story plan, 3D Elevations etc. According to the guidance from our institute’s AutoCAD professionals, your computer system should have at least one CD drive or Pen Drive port and a hard disk with 2GB or more of free space for the AutoCAD program files without which the AutoCAD training will be difficult. Make sure your resolution is set to 1024×768, higher your screen resolution, the more details you will be able to see in your drawings. Graphics card for 3D drawings is also recommended. 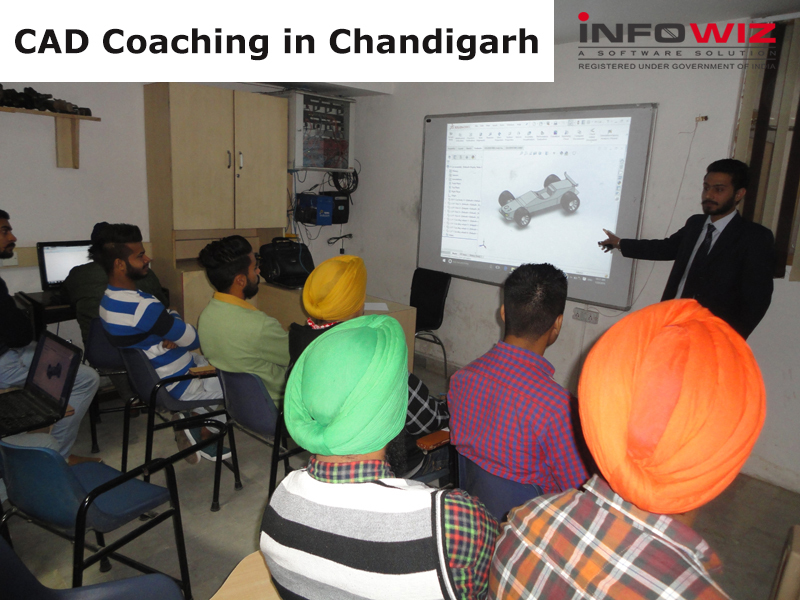 Why Our Institute is a best for CAD Coaching in Chandigarh? Finding the best institute for AutoCAD Training in Chandigarh is very tough as there are many AutoCAD institutes who make fake promises. iNFOWIZ is the only AutoCAD Training Institute in Chandigarh which offers highly proficient and technical training in AutoCAD. This two months specialized course will make our students AutoCAD expert. Students will learn how to set up, create, and edit 2D drawings with the use of AutoCAD application and after becoming proficient with the basic techniques for creating and navigating a technical drawing; our mentor will disclose 3D capabilities of AutoCAD application. Students will learn advanced features and techniques like accurate drawing setup techniques, geometry creation, editing functions, display, printing, and plotting techniques etc in AutoCAD Course. Know why to choose Infowiz Software Solutions for best AutoCAD Training in Chandigarh for engineering students & professionals. If you require any further information regarding our advanced CAD Coaching in Chandigarh, please contact +91-9888-500-888. This Autodesk Auto CAD Course in Chandigarh is designed to train the aspirants over professional 2D & 3D computer design program for making 2D & 3D structural design or architectural design or machine model. Such as engineers who are engaged with that organization who design 2D & 3D models and works over the various aspects of designing.